11 bloody marys. 3 hours. 200 bloody mary enthusiasts. With its unlimited tomato-based cocktail creations, the Brooklyn Bloody Mary Festival was an absolute sold out success. I had the pleasure of judging the competition with three other celebrity bloody mary aficionados. Matt Bruck of Joios Inc., the lovely Diane Mina, and Mr. Danny Gottlieb each took their judging roles with a serious professionalism, enthusiasm, and drive to determine the best and most original bloody marys in Brooklyn. Each attendee also received a chip to cast their vote for the People's Choice award. With its kimchee and nori seaweed garnish and spicy sriracha mix, both the First Place judge's award and the Most Original award went to Greenpoint's Lucky Luna. With its big garnish and well balanced bloody mary blend, Congress Bar of Cobble Hill took second place (and served as the majority of my Sunday breakfast). Finally, the People's Choice award went to Olea's uniquely garnished bloody mary topped with an almond-stuffed, bacon-wrapped date. Big thanks to the Bloody Mary Liberation Party and hosts Evan and Yunna Weiss for such an amazing event! I was happy to play a NYC tourist for the weekend. If you enjoy unique and innovative bloody mary recipes, click here for my free tips, "5 Surprising Ingredients to Revamp Your Favorite Bloody Mary Recipe (Hint: They May Already Be in Your Kitchen!)" 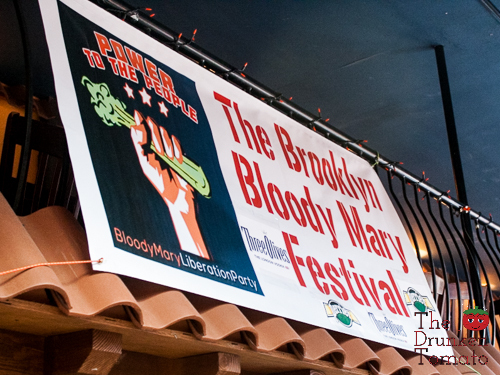 Get Ready For Brooklyn's First Annual Bloody Mary Festival!